Brazilian President Michel Temer is again facing the types of pressures he subjected his predecessor to as corruption charges continue to dog his presidency. On Tuesday, an impassioned Temer took to national television to appeal to the Brazilian public and claim his innocence amid refresh bribery charges from the Prosecutor General. Rodrigo Janot on Monday formally charged Temer with accepting $11.47 million in bribes from officials at Brazil’s biggest meatpacker, JBS SA, to cover up corruption within their company. The officials had offered up the information as part of a plea bargain during an investigation into corruption in the meatpacking industry. In March, at least 21 major meatpacking companies like Souza Ramos, Transmeat, Seara Alimentos Ltda (owned by JBS) and Peccin based in the southern state of Parana came under investigation. The investigation alleged that the meat inspection process was fundamentally flawed and that officials in some states were paid by meatpackers to look the other way. Some countries temporarily banned meat and poultry imports from Brazil as a whole, while others just targeted the meat-packers in question. 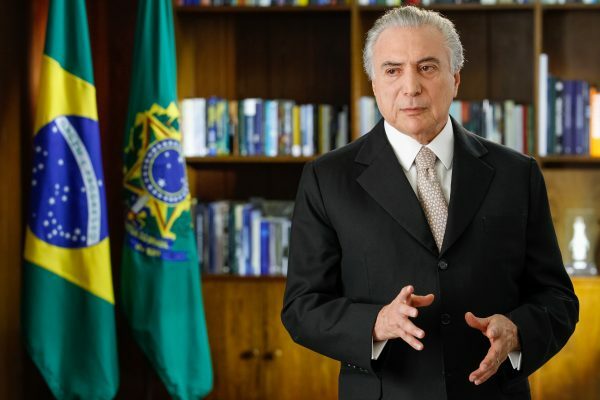 Temer said that the bribery accusations against him were works of fiction, and that he was being targeted by these officials as a means to reduce their charges. But it will now be up to the Lower House of Parliament, or the House of Deputies, to decide by a two-thirds vote whether Temer will have to face a Supreme Court trial. This is the kind of publicity Temer does not want as he tries to pass crucial, albeit controversial, reform packages through Congress. Local newspaper O Globo alleged on Wednesday that President Michel Temer, who had been beset by accusations of corruption since he took over from Dilma Rousseff last year, had been recorded talking about making payments to former House of Representatives (Chamber of Deputies) Speaker Eduardo Cunha. Cunha, once the strongest instigator and supporter of the impeachment proceedings against former President Dilma Rousseff, was himself expelled from chambers last September on charges of lying about having a secret Swiss bank account and other allegations related to the Petrobras scandal. He was sentenced to 15 years prison in March. Rousseff herself was never implicated in any corruption linked to Petrobras but was impeached because of mishandling and misrepresenting the federal budget during her 2014 reelection campaign.